VWO Visitor Recordings allows you to record visitor interactions with your website in a video form. The recordings show how users browse your website and capture their mouse movements, scrolls, and clicks throughout website pages. Let’s look at how you can interpret a Recordings report. 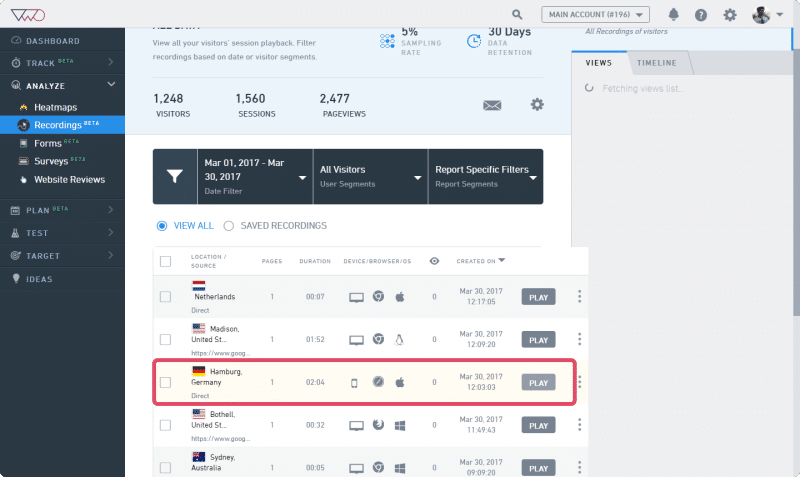 To access the reports section of your VWO Visitor Recordings, click Analyze > Recordings. In the Recordings dashboard, select the recording you want to view. Play/Pause/Next/Previous and Adjust Playback Speed: As in a standard digital player, a Visitor Recording interface has separate buttons to play, pause, and adjust the playback speed of a video. Page URLs: It shows the URL of the current page. Show clicks: Select this option if you want the clicks to be highlighted in a recording. The color codes for the left-click and the right-click are shown in the screenshot below. Show Mouse Trail: Select this option if you want to record mouse movements. Skip Pauses: Select this option if you want to see only the portions which have activity. Autoplay Next Page: Select this option if you do not want to click Next manually to analyze the next page in a session. Traffic Sources: This section highlights your traffic sources in terms of the platform, browser, device, and demographics. Share/Download/Save/Delete: Click any of the three options to perform the respective action.